THE Detail’s Kathryn Torney has won another national award for outstanding excellence in journalism. Kathryn was named as the Royal Statistical Society’s 2013 online winner in its Statistical Excellence in Journalism Awards for her investigation into segregation in Northern Ireland’s schools. It is the second major award Kathryn has won this summer. In June she was named Digital Journalist of the Year at the Northern Ireland Media Awards. The Royal Statistical Society established its awards for statistical excellence in journalism in 2007 to encourage excellence in journalists’ use of statistics to question, analyse and investigate the issues that affect society at large. The Society says that journalistic excellence in statistics helps citizens to hold decision makers in all sectors to account – through accessible communication of complex information, highlighting of success, and exposure of important missing information. The judges said they were particularly impressed by Kathryn’s use of Google Maps and felt her article’s key strength was in enabling the reader to get beyond a conventionally presented story to find out relevant local data. “This was done in a way that demonstrated how data can be used to go beyond political point-scoring,” they said. Times journalist Daniel Finkelstein was named as the winner in the newspaper section for his Fink Tank column. Radio 4’s Tim Harford was named as the broadcast winner for his radio programme ‘More or Less’. Praising the winning entries, judges’ spokeswoman Dr Jenny Freeman said: “This year saw the second largest number of entries to our awards for statistical excellence in journalism. There were many which showed good use of statistics and data. This presented the judges with the challenging task of deciding overall winners. Congratulating Kathryn on her latest success, The Detail’s editor Ruth O’Reilly said: "Kathryn introduced data journalism to Northern Ireland when she joined The Detail. This is just the latest award for The Detail since it went live in March 2011. In June 2013 The Detail was named NI Media Website of the Year. Kathryn Torney was also named Digital Journalist of the Year for her data journalism projects on gun ownership in Northern Ireland, the religious make up of our schools and parking tickets. In May Barry McCaffrey was awarded the Overall Justice Media Award for his work on the use of solitary confinement in Northern Ireland’s prisons. In 2012 Niall McCracken was named as CIPR Media award’s Newcomer of the Year for his work on dementia, healthcare regulation and the inquiry into hospital fluid-related deaths of children here. Kathryn was shortlisted for the international Data Journalism Awards in 2012 and 2013. 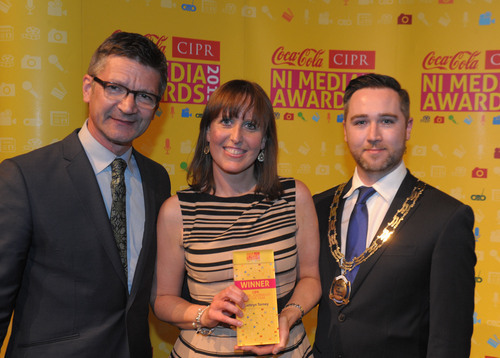 In 2012 The Detail was named as CIPR Specialist Website of the Year at the NI Media Awards.